1939 is undoubtedly the most celebrated year in American film history - the year produced more outstanding films than any other 12-month period. It was bound to be difficult for the Academy to nominate or honor all the rich, outstanding films of the year. This year, the first Oscar for Visual Effects (a new category) was given to The Rains Came, defeating Gone With the Wind's nomination (one of five that did not win) that included recognition for its remarkable burning of Atlanta sequence. The Wizard of Oz's nomination for Visual Effects (undoubtedly for its exceptional cyclone sequence) was also defeated. For the first time this year, the Cinematography award was divided into two categories: Black and White, and Color. Director Victor Fleming's almost four-hour long blockbuster film was the longest feature film released up to that time - and it was the major Oscar winner of the year. It was also the first color film to win Best Picture. The epic was obsessed producer David O. Selznick's romantic costume melodrama Gone With the Wind, a story of the Civil War South (from Margaret Mitchell's best-selling Pulitzer Prize-winning novel) told by following the story of a tempestuous, headstrong Southern heroine from the O'Hara family who was married three times and carried on an unconsummated love relationship with a Southern gentleman from the Wilkes family. It was the first Best Picture-winning film that was a Pulitzer Prize-winning novel (the second was All the King's Men (1949)). The film had thirteen nominations and won eight competitive awards (and two special citations) - both records for the time. [It would hold this record until Gigi (1958) won a record 9 Oscars.] The blockbuster film was the number one box-office champion for many years. Its awards included Best Picture, Best Director, Best Actress, Best Supporting Actress (Hattie McDaniel - the first African-American performer to be nominated and win), Best Screenplay, Best Color Cinematography, Best Interior Decoration, and Best Film Editing. The only major award it didn't win was Best Actor for Clark Gable, meaning that it wasn't able to sweep the "Top Five" awards categories. 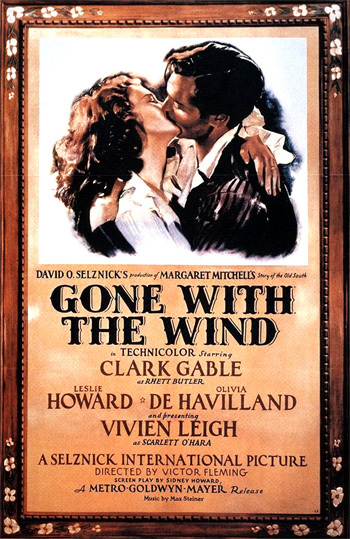 The credited screenwriter for Gone With The Wind was Sidney Howard - he received a posthumous Oscar and became the first posthumous winner. 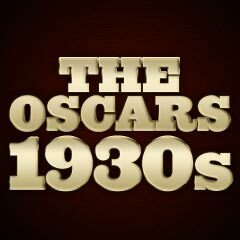 A change in the Academy rules required that directors could be nominated for only one motion picture in a single year. Frank Capra, John Ford, William Wyler, and Sam Wood - all great directors for Oscar-nominated films, couldn't overcome the almost-total sweep of Gone With The Wind. Best Director winner Victor Fleming also directed another Best Picture nominee in 1939, The Wizard of Oz. One of the few categories where the celebrated Best Picture didn't win was Best Actor. British actor Robert Donat (with his second - and final - consecutive nomination and sole Oscar) won the Best Actor award for his touching performance as the shy British schoolmaster Mr. Charles Chipping at his beloved institution, who evolves from a novice to a respected headmaster in Goodbye, Mr. Chips (from James Hilton's novel). It appeared that he was being honored as much for his neglected performance in Hitchcock's The Thirty-Nine Steps (1935) and for his Oscar-losing performance (to Spencer Tracy in Boys Town (1938)) in The Citadel (1938) from a year earlier as he was for the part of the schoolteacher. Both lead acting awards were presented to British performers - for the first time in Academy history. Unknown 24 year old brunette actress Vivien Leigh was the first British female star to win the Best Actress award - for her role as the flirtatious, petulant Southern belle Scarlett O'Hara in Gone With The Wind. Thomas Mitchell (with his second and last career nomination and sole Oscar), who had played Scarlett O'Hara's father Gerald in Gone With The Wind, a grounded flyer Kid Dabb in Howard Hawks' Only Angels Have Wings (with two nominations and no wins), a newspaperman Diz Moore in Frank Capra's Mr. Smith Goes to Washington, and Clopin, the King of the Beggars in director William Dieterle's best version of the Victor Hugo classic The Hunchback of Notre Dame (with two nominations and no wins) won the Best Supporting Actor award for another role: his whiskey-soaked, drunken Doc Boone in John Ford's celebrated Western, Stagecoach. Hattie McDaniel's Best Supporting Actress award for her unforgettable role as Scarlett O'Hara's devoted but sly Mammy in Gone With The Wind was significant. She was the first African-American Oscar nominee and winner - and she was the first black guest to attend the awards ceremony. However, she was relegated to a seat at the back of the Cocoanut Grove, away from her colleagues on the film. Disney won another Short Subject: Cartoon Oscar for The Ugly Duckling - his eighth (and consecutive) win in the category. His streak would be broken the next year, when MGM won for Milky Way (1940), while Disney was pre-occupied with Pinocchio (1940) (with two nominations and two wins for Best Original Music Score and Best Original Song). The only opportunity that actor Lon Chaney, Jr. had of being nominated was for his performance as Lennie in Of Mice and Men, but there were too many other competitors and he was not nominated. The Oscar for Best Visual Effects, awarded for the flood disaster sequences in The Rains Came, should have been awarded to either Gone With The Wind's burning of Atlanta sequence, or the flying monkeys sequence in The Wizard of Oz. The most identifiable of all film scores (Tara's Theme in Gone With The Wind) was composed by Max Steiner, but he was defeated in the Best Original Score category by Herbert Stothart for The Wizard of Oz - not for the popular songs, but for the film's incidental music (including the recognizable theme music for Miss Gulch on her bicycle or the Wicked Witch on her broom, and the "Somewhere Over the Rainbow" instrumental theme)!